Does fossilization require rapid burial as the result of catastrophic global flooding? Literalist creationists would have us believe so for they point to the fossil record as being proof of a cataclysmic global flood. Look a bit deeper though and you will find that creationists frequently concede there are thousands of exceptions to this general perception. 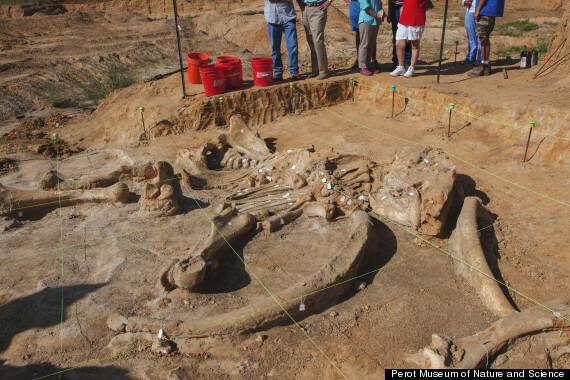 Wooly mammoth skeleton unearthed in North Texas. Photo: Perot Natural History Museum. Yesterday we learned about one of these many exceptions. In north Texas a nearly complete mammoth has been unearthed on a private residence during an excavation project. Just look at this impressive skeleton. It looks like a mammoth just laid down and died here recently. But these are not just bones from a recently deceased animal but rather bone that have progressed along the path to fossilization – a path that has taken many 10s of thousands of years. Mammoths and mastodons were common in North American in the Pleistocene era commonly thought of as a time of the most recent Ice Ages. Thousands of tusks and even whole animals have been found in many states and are on display in museums all around the country. Did this mammoth die in a global catastrophic flood 4500 years ago? Most surely not and even young earth creationists (YECs) agree. They believe that these mammoths are descendants of a pair of elephants that walked off of Noah’s Ark in the middle east about 4500 years ago. They migrated to NA across the Bering Land Bridge during an Ice Age filling North and Central America with elephants. So the bones you see before you here are not the result of a great flood but were preserved by some other means. A likely scenario is that this mammoth likely found its way onto a mudflat of a receded lake or stream where it died. It was probably scavenged by birds and small animals but the bones were left behind. The lake may have been suddenly been raised by a local flood or even normal annual changes and the bones covered with sediments. Eventually that lake was filled in by sediments burying the bones under 10s of feet of sediment. There the bones have begun the process of fossilization. These bones would probably be best considered subfossils because they probably still contain a significant portion of the original material that has not yet been mineralized. Many people confuse mammoths and mastodons for good reason since both lived in North America. However, they were quite different from one another. Below is an image from Wikipedia showing the differences between these two amazing extinct species. I did my dissertation on the fossilization of bone in terrestrial environments, so stories like this always interest me. Nice article. I see the photo is from the Perot Museum. That’s a very good museum, quite a nice addition to the Dallas/Ft. Worth area. I agree that the bones almost certainly contain some original material that has yet to recrystallize to form good fossil bone. I would not be surprised if the bones were encased within deposited minerals derived from the outer edges of the bone and surrounding minerals though. That can happen surprisingly quickly. One question I have is the identification of the skeleton as a woolly mammoth. North Texas seems a bit southern for them. Mammoths from this region of the country are usually ascribed to columbian mammoths, which were generally a little bigger and a lot less hairier. In Arkansas where I am, we have both mammoths and mastodons, so I get to talk about the differences between them a fair bit in terms of diet and habitat preference, which is nice. Thanks for the additional information. I don’t have any first-hand knowledge at all about this skeleton, just going on the common news reports which are admittedly not the best sources. I assume the tusks and frontal lobe of the braincase were giveaways but I did wonder about the range of the wooly mammoth. Seemed south for me as well. It could be that this is a case where it was called a mammoth and some news reporters started calling it a wooly mammoth assuming that was the only species. I doubt many people are aware of the columbian mammoths. Pretty much a strawman argument you have made here. First pretend that creationists believe all “fossilization require[s] rapid burial as the result of catastrophic global flooding”, and then shoot that phony argument down. Easy pickins when you make up arguments the other side does not argue. I’m aware that the YECs in the know understand that a global flood isn’t necesary to explain any fossils at all but the average christian in the pew is asked will tell you that most fossils had to be the result of massive flood because they have been given that impression by YEC leaders. I talk to homeschool students all the time and the vast majority of them immediately assume when they see a fossil that the only possible source is a global flood. As you say, I know that his is not what YEC “scientists” believe but it is the impression they make when they give talks. I attended a talk a few months ago in which the speaker showed 20 examples of fossils like fish eating fish etc.. and claimed that these were evidence of a global flood. After the talk, I pointed out that every example was from a post-flood deposit and thus not the result of a global flood. The response was that they knew that was true but these were local flood or events that were no different than a global flood so it was okay to present them as being example of a global flood. But of course the audience got the impression that all fossils are the result of a global flood. That is my only point with this post. Perhaps you could have made that distinction clear in your initial blog entry, rather than misrepresenting the scientific opinions of YECs about post-Flood fossilizations as among “thousands of exceptions” to a non-existent “rule”. I don’t know what ” the average christian in the pew” has to say about this subject, because I have not asked anywhere near as many as you must have interviewed. Nevertheless, your comments do not explain the typical neo-Darwinian uniformitarian contention, that layer upon layer upon layer of infinitesimally thin sediments, made ever so slowly over millions of years, could possibly have trapped such a huge, three-dimensional mammoth and fossilized its bones in place, before they turned to dust or were dispersed. This mammoth certainly could not have been buried uniformitarianly. To summarize your comments, you start out by asking: “Does fossilization require rapid burial as the result of catastrophic global flooding?” Your answer of course is “no”. But you go on to state: “So the bones you see before you here are not the result of a great flood but were preserved by some other means.” But then you conclude that that “other means” was that the mammoth may have died in a lake bed that then had “suddenly been raised by a local flood”. FYI, “suddenly” is another word for “catastrophically”. So, you dispute that it was buried in “The Flood” but believe the “likely scenario” that it may have been buried in “A Flood”. And I agree with that possibility, because assuming that the mammoth died in place and appears to be almost fully intact, then whatever sediments buried it had to have been placed very rapidly (I suggest even before the soft tissues and tendons deteriorated), before the water currents had the opportunity to spread loosened bones apart and disperse them all over the place. Yes, likely buried in a flood. A flood that is not unlike any flood that happens today. Many fossils in the fossil record also attest to similar floods throughout history, others are found in volcanic ash layers etc.. Not sure where these mammoths that have been buried in infinitesimally thin sediments over millions of years are that you refer to. What do many thin layers require millions of years? You seen to have your own strawman argument going here with your definition of uniformitarianism. There are so many different ways that fossils are formed which itself is a testimony to the many different environments that organisms have lived and died in rather than a global flood in which the type of preservation should appear more uniform. You ask: “Not sure where these mammoths that have been buried in infinitesimally thin sediments over millions of years are that you refer to. What do many thin layers require millions of years? You seen to have your own strawman argument going here with your definition of uniformitarianism.” — If you are unfamiliar with the conventional definitions of neo-Darwinian uniformitarianism and gradualism, then just forget it. Conventional definitions? It sounds to me like you’re the one redefining terms here, Rod. Nothing in uniformitarianism or gradualism (the latter is unrelated to fossil burial or sedimentology, by the way) would lead us to expect that terrestrial fossils are buried in “infinitesimally thin sediments over millions of years”, because that’s not how it happens today. It’s a gross misunderstanding that uniformitarianism is prescriptive of geological rates. The concept merely alludes to the use of known geological phenomena to describe, explain, or constrain past ones, resting on the assumption of constant natural law. When mammals die, they are subject to a wide range of processes that could promote or inhibit preservation, all of which occur at different rates. Whether a mammoth was buried instantly by flooding or gradually at the bottom of a lake, we describe each instance using ‘uniformitarianism’. Also, uniformitarianism as a scientific concept predates Darwin and functions independently of his theories. Your attaching “neo-Darwinian” to the term is therefore inappropriate. I am well aware of the source of the concept of uniformitarianism and it pre-dating Darwin, who himself predated neo-Darwinianism. Nevetheless, neo-Darwinianism relies heavily upon that concept, so the term therefore is appropriate. Similar to some YEC presenters’ efforts to strongly separate the concepts of “micro” and “macro” evolution, I notice that some also like to make a big deal about “uniformitarian(ism)” and “catastrophe(ism)”, suggesting it’s either/or. Geology, at least since J Harlan Bretz’s work in the 1920s on the Missoula ice age floods, has recognized that there are catastrophic, short term events that leave their mark on the landscape and subsequent geology as well as longer-term processes that continue more-or-less steadily for millennia. Of course that was the raging debate at the time (unformitarianism vs catastrophic explanations), but the answer came from within standard geology and not from the “Flood Geology” of that era, nor was it better explained by Morris/Whitcomb and those after them. Both are typical YEC about notions about (palaeontology, geology, evolutonary biology) that have no counterpart in actual (palaeontology, geology, evolutonary biology). Peter, you appear to be engaging in some convenient, transactional re-defining of neo-Darwinianism. Those “notions” are based upon numerous peer-reviewed publications written by evolutionary palaeontologists and geologists and biologists. If they (and you) no longer believe in gradualism and uniformitarianism, then how do they and you justify billions of years of evolution on earth? Rod, you won’t find geologists and biologists using the terms “neo-Darwinian”, “uniformitarian”, and “gradualism” in the same fashion as you, especially in peer-reviewed literature, which is why geologists and biologists are now taking issue with your odd nuances. Also, numerous biologists and geologists that have rejected gradualism and uniformitarianism, respectively, did not have a problem concluding that Earth’s life evolved over billions of years. You’ve set up a false dichotomy here with your misused terms. Actually, they are not: Rod’s ‘notions’ are purely a YEC invention. Rod’s statement only proves he has no notion whatever what is written in those “numerous peer-reviewed publications written by evolutionary palaeontologists and geologists and biologists.” We meet the usual problem: no background. The millions of years are based on concordance in radioactive dating methods; that is the millions of years are based upon physics, not on paleontology, geology, evolutionary biology. Age of Rocks has pointed out that Snelling is not able to deny the measured age of the solar system. (If not Age of Rocks, a blog that is reached from Age of Rocks). That is clear too from the Origins 2014 abstract “Radioisotope Dating of Basaltic Achondrites” (by way of Todd Wood’s blog: http://www.coresci.org/jcts/index.php/jctsc/article/view/37 ). Peter, the notions have been peer reviewed. Here are a couple of citations: The Pleistocene Epoch in Deep-Sea Sediments A complete time scale dates the beginning of the first ice age at about 1½ million years ago. DB Ericson, M Ewing, G Wollin – Science, 1964; The California River and its role in carving Grand Canyon. Brian Wernicke. Geological Society of America Bulletin, 2011. The “millions of years” are in part, as you say, based upon “concordance in radioactive dating methods”, but that “concordance” is with palaeontologic dating of fossils. Once the ages of measurable rocks are determined, the sediment layers between them are counted to determine their rates of accumulation, largely as uniformitarian measurements, such as once a year or season. But this has nothing to do with the mammoths’ fossils, which obviously were buried by flood waters.and not, as the blogger alternatively suggested, by gradual, uniformitarian, “normal annual changes and the bones covered with sediments”.